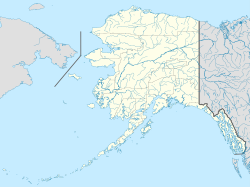 Chiniak (Cing’iyak in Alutiiq) is a census-designated place (CDP) in Kodiak Island Borough, Alaska, United States. The population was 47 at the 2010 census, down from 50 in 2000. Chiniak is located at 57°36′38″N 152°11′59″W﻿ / ﻿57.61056°N 152.19972°W﻿ / 57.61056; -152.19972 (57.610603, -152.199817). According to the United States Census Bureau, the CDP has a total area of 38.8 square miles (100.4 km2), of which 38.7 square miles (100.2 km2) is land and 0.077 square miles (0.2 km2), or 0.18%, is water. Chiniak first appeared on the 1880 U.S. Census as an unincorporated Inuit Village of 24 persons (all Inuit). It was likely abandoned some point soon after, as it did not appear on the 1890 census or until 100 years later in 1990, after the area was resettled by non-natives and made a census-designated place. As of the census of 2000, there were 50 people, 24 households, and 13 families residing in the CDP. The population density was 1.2 people per square mile (0.5/km²). There were 32 housing units at an average density of 0.8/sq mi (0.3/km²). The racial makeup of the CDP was 88.00% White, 2.00% Native American, 2.00% Asian, 6.00% from other races, and 2.00% from two or more races. 8.00% of the population were Hispanic or Latino of any race. There were 24 households out of which 25.0% had children under the age of 18 living with them, 45.8% were married couples living together, and 41.7% were non-families. 37.5% of all households were made up of individuals and 8.3% had someone living alone who was 65 years of age or older. The average household size was 2.08 and the average family size was 2.71. In the CDP, the population was spread out with 18.0% under the age of 18, 6.0% from 18 to 24, 14.0% from 25 to 44, 56.0% from 45 to 64, and 6.0% who were 65 years of age or older. The median age was 49 years. For every 100 females, there were 194.1 males. For every 100 females age 18 and over, there were 173.3 males. The median income for a household in the CDP was $14,167, and the median income for a family was $75,067. Males had a median income of $51,250 versus $0 for females. The per capita income for the CDP was $22,211. There were no families and 20.0% of the population living below the poverty line, including no under eighteens and none of those over 64. Chiniak is a diverse community. Original members were completely off the grid: no electricity, telephones, running water. Life today in Chiniak is comparatively easy. All amenities are available, as well as a paved highway most of the way to the village. The Chiniak School, a K-12 rural school, is operated by the Kodiak Island Borough School District. There is located the "end of the road". Towards mile 35 there is a Post Office open 3 days per week. Near the school there is a library. Elaine Griffin won Teacher of the Year for Chiniak School in 1995. Several skilled artisans live and work in Chiniak, including landscape artist G.A.A., and potter Susan Baker, who sells and exhibits work island wide and is one of the few potters on Kodiak Island. Chiniak School, Chiniak post office, and the Chiniak Library, are the only public buildings. Chiniak Public Library burned down in the 2015 Twin Creeks Fire. It is currently being rebuilt. ^ 2015 Alaska Municipal Officials Directory. Juneau: Alaska Municipal League. 2015. p. 11. ^ a b "Geographic Identifiers: 2010 Demographic Profile Data (DP-1): Chiniak CDP, Alaska". U.S. Census Bureau, American Factfinder. Retrieved March 21, 2013. ^ "Our Schools." Kodiak Island Borough School District. Retrieved on February 15, 2017. This page was last edited on 16 December 2018, at 19:07 (UTC).